Provide comfort for the family of Patricia Anderson with a meaningful gesture of sympathy. Patricia Marie Theresa Walsh Anderson; RN, educator, widow, mother and grandmother, died quietly at the hospital after a brief illness on April 8, 2019. A lifetime supporter of the arts, advocate for children and charities, and a fun great bridge player and friend, Patricia sought to be a great loving support to all. Born in December 1932 in New York City to William Lunghard, a NY Police Officer and Margaret Lunghard, an administrator at ABC. Patricia was raised in the Bronx and attended school in NYC She went on to Nursing School in NJ and became an RN. Patricia worked in the Operating Room with her dear friend, Dottie Frank, and ended practicing as head of nursing at Elizabeth General Hospital, in Elizabeth, NJ. The highlight of her education was getting her master’s degree in Education in her 50’s. She then went to the Edison, NJ school system where she taught health and then also became a school nurse. Patricia went on to lead as a member of the Edison Township Board of Health as a supervisor until her retirement at age 68. Patricia married Howard Walsh of North Arlington, NJ in 1959. Their greatest gift was the adoption of their beloved daughter, Meg in 1963. They lived happily together in Linden, NJ until Howard’s death at an early age when Meg was only 8. Patricia then went on to marry and be widowed twice more. Her last husband, Wes Anderson, lifetime love, passed of illness after only two years of marriage. In that marriage she gained two amazing step-daughters, Von and Nancy. They adored her and called her the bonus Mom! Patricia had many friend’s, but her dearest were her HS girlfriends whom she met with monthly for over 40 years and who shared all of their joys and challenges. Her best friend was Joan Nalwasky and they were inseparable in loving friendship, may they be meeting in heaven now. Patricia lived at the Four Seasons in Wall Township for almost 20 years with a fabulous community of friends and families that traveled, played bridge and shared the many delights of children and grandchildren. She was a member of many groups including the Manasquan River Golf Club, Red Hats, Brielle Women’s Club, Cornerstone Prayer Group, and many Bridge teams. She was adored by her many friends and always knew how to have a great time and throw a great party. Patricia is survived by the loves of her life; daughter Meg and grandchildren Patricia and Brennan, and daughter-in-law and partner in crime, Patti Columbia-Walsh. Surviving family includes her dear cousin Kathy Stern, Kathy’s husband Robert and son Matt. Christine and Joey Bien, surviving children of Rose and Tommy Bien. And three adoring Godchildren; Michael, Jennifer and Carolynn. At the end of her life, Granny as she was known, lived with Meg and family and delighted in the ever-rotating sports schedule of her grandchildren. The biggest fan and threat to refs worldwide, you could hear her cheering across the gym and fields. A competitive card player to the end, even if the pot was M&Ms. A quote that suits Pat well was, “We aren’t here for a long time, we’re here for a good time!” In her ‘not long enough time’ among us, Patricia Anderson did as much, making the most of every day, having a good time, and reminding the rest of us to do the same. May that spirit and her essence be with us always. A celebration of her life will be held at a wake at Orender Family Home for Funerals 2643 Old Bridge Road Manasquan, NJ on Friday, April 12 from 4-8pm. A Mass of Christian Burial will be at St. Martha’s Roman Catholic Church, Point Pleasant on Saturday April 13th at 10:30 am. In lieu of flowers, gifts in Pat’s memory can be made to the Family Equality Council in honor of her Grandchildren, Brennan and Patricia Columbia-Walsh, (www.familyequality.org). Orender Family Home for Funerals is honored to assist the family with the arrangements. Online condolences may be left for the family of Pat by emailing Meg at mcolumbiawalsh@gmail.com. To send flowers in memory of Patricia Walsh Anderson (Lunghard), please visit our Heartfelt Sympathies Store. Donations are being accepted for: Family Equality Council. 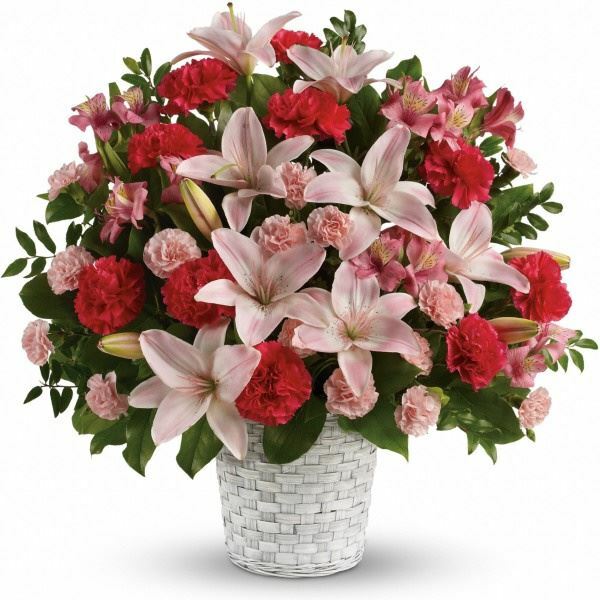 Provide comfort for the family of Patricia Walsh Anderson (Lunghard) by sending flowers. With heartfelt condolences, to Meg , Patricia and Brennan. Memories of Pat will live in our hearts. Heartfelt Sympathies Store purchased the Sweet Sincerity for the family of Patricia Anderson.